:: NikG* Life + Style ::: Hair Babble: Update! So for the past few months, I've been slowly taking inches off of my hair. I've been pretty unhappy with my hair (a) because the detangling was just getting too hard to manage, (b) whenever I wore curly styles I just felt like it was too much hair and hated that I could feel it "touching" me, and (c) when straight it just felt pretty boring. This is the length straight--shortly after I'd cut it. For reference, my hair use to cover the boobies. I'm happy about the curly "bob" look! Who knows, maybe I'll let it grow back as the weather gets cooler in the Fall, for now I'm sticking with this! Anyway, have a great week! Jinx! I was just readying a hair update post. Love the length; I guess I can't help but to since mine is about the same now. Detangling is a breeze, but I must admit I miss me length. I'm growing it back out. It still looks good but why didnt you curl or do different styles when it was straight so that it wasn't so boring? I'm definitley contemplating cutting mine when I get into the 4-0 lol hair longer than BSL is definitley a partime job...Im going to discuss more in a post soon. THx Zhara--I look forward to reading your post! Cali--I did different styles when it was curly as far as pin-ups, etc. My hair when flat ironed straight, however, won't hold a curl almost at all--so that didn't work. I still found the length somewhat hindering with other styles. Love the curls. It looks very nice. Love the new cut! You look gorgeous! Is your hair completely blunt now? 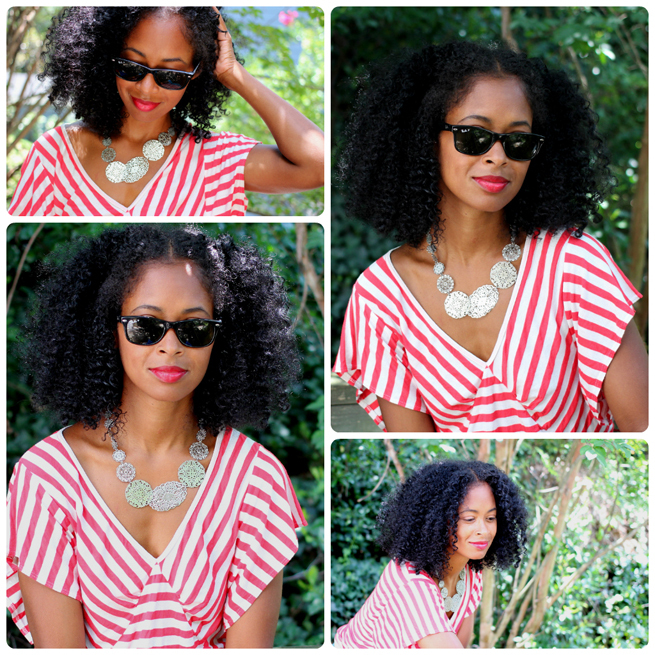 I especially love that red striped top! you are a beauty short hair longhair doesn't matter..one of these days I'm going to make an acct so I'm not "anonymous" lol anyway my question is how do you get your trims so even since you self trim? It looks great! Cute romper too. I love you hair Nik! Please post an updated product list regimen! I love it like this but probably because that is my goal length hair when curly for myself. I think changing hair up is fun but my 4-5" chop still hasn't recovered. I keep cutting due to the split ends that occurred when I only doing wng's.